Trinity Designs: Exciting News from Stampin' Up! Here you are - Hot off the Presses! Amazing, never heard before news! The limited-time Three Easy Payments option for purchasing the Starter Kit is here! This option allows a new demonstrator to make a partial initial Starter Kit payment and still receive the Starter Kit right away in order to get your business up and running. If you have ever given even a passing thought to trying out the demonstrator opportunity, the time is NOW! If you try it out before March 31st, you still receive the SALE pricing on the Starter Kit AND the additional FREE stamp set of your choice from the catalog. 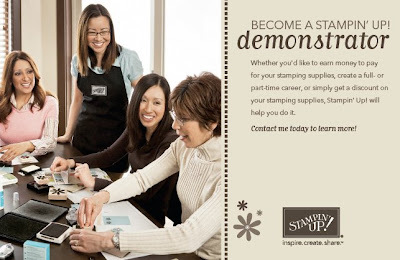 Have you ever wished you could receive a discount on all your Stampin' Up! purchases ALL the time? Have you ever wished you could earn some extra income to cover the end of the month at the end of the money? How many of you just want to be part of a fun group of creative people in a positive environment? At the time a new demonstrator signs up, she fills out her Starter Kit form and other paperwork as usual, but must also write "Three Easy Payments option" at the top of each form. The new demonstrator must also complete a separate Three Easy Payments form, available for download from the Customer and Demonstrator Web Sites. Using the credit card information provided on her Three Easy Payments form, Stampin' Up! charges the initial Starter Kit payment (see the table below for a breakdown of payments) on the day paperwork is processed and sends out the Starter Kit. On or around the 15th day of the two months following the month Stampin' Up! received the paperwork, Stampin' Up! will charge the subsequent payments using the same credit card information provided on the Three Easy Payments form, and the Starter Kit will be paid in full. Stampin' Up! will only accept the same credit card for all three payments, as provided on the Three Easy Payments form. Checks or money orders will not be accepted. To qualify for the Three Easy Payments option on the discounted Sale-A-Bration Starter Kit price of $169, Starter Kit paperwork and an accompanying Three Easy Payments form must be received by Stampin' Up! (not postmarked) on or before March 31, 2009. Paperwork received after this time will be processed for the regular Starter Kit price of $199. For new demonstrators who wish to add the Stampin' Memories Starter Kit add-on for $50.00, this full amount (including any applicable taxes for the add-on) will be added to their initial Starter Kit payment. The Three Easy Payments option is not available through the Online Independent Demonstrator Application. Recruits who wish to take advantage of the offer must submit their paperwork by mail. I would love to hear from you and answer your questions - no strings, just the answers you need. Contact me via e-mail or phone. I'm here through Friday 3/20, then I leave on the Stampin' Up! Hawaii trip for a week. My office assistant Shellie will be available to assist you while I am gone. The last day to take advantage of this payment plan offer at the discounted price will be 3/30 at noon since the paper work must be mailed and received at Stampin' Up! by 3/31.